An emblematic driver in the Parolin Racing Team, Gabriele Mini’ perfectly fulfilled his mission by bringing his Parolin chassis to the highest international level. The winner of OK-Junior in the WSK Super Master Series, 2nd in the European Championship and vice-World Champion, the young Italian proved the exceptional level of performance of Parolin by becoming the most consistent driver of the season in the top rankings. Equipped this time with a TM Racing engine, Gabriele Mini’ was notable for his speed in the Free Practice sessions of the FIA Karting World Championship – Junior in Sweden. He officially confirmed this by setting the pole position time in Qualifying, nearly 3 tenths of a second in front of the other 112 participants. Rain then thwarted the forward march of the Parolin driver in the first few heats. He restored the situation by finishing with two victories while sparing his tyres. 7th on the starting grid of the Final, Mini’ set off in pursuit of his rivals as soon as the lights went out by using all his talent to exploit the very good balance of his Parolin-TM. He was in the top three in the first third of the race and finally found the opening two laps from the finish to grab 2nd place with much panache. Clearly faster than the future winner, he unfortunately did not have time to narrow the gap before the chequered flag. 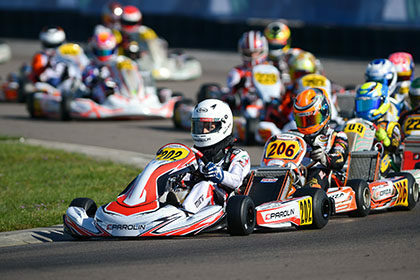 In addition to the title of Vice World Champion for Gabriele Mini’, Parolin Racing Kart can congratulate itself for enabling the young Australian James Wharton to come back from the 20th to 13th position in the World Championship, a result of first order for the third international race for this driver in OK-Junior.